According to Lockwood Brooks had resigned last year as it was hard to balance being a pastor of a church while also serving as a director of Camp Koinonia. This in turn left a vacancy in the church for a new pastor. Since then Lockwood said he has continued to get involved in the church in a variety of different ways leading up to his installation of lay pastor as of Sunday, March 3 through Executive Minister/Ministry Development for American Baptist Church of Ohio Jane Gibbons. While getting involved in the church was a gradual process, Lockwood said that he wasn’t sure at first when it came to taking on the main role of pastor for the church once it was available. Now that he will be taking on the main role, Lockwood said that he plans to try and keep things balanced as much as possible as he also works as a Service Support Administrator for Ashtabula County Board of Development Disabilities as he has a degree in sociology that he earned at Hiram College. As he looks back on his experiences visiting First Baptist Church of Dorset, Lockwood attributes a lot of his growth to his grandmother’s influence. He also has several favorite theologians that have continued to inspire him over the years as well, including Charles Spurgeon, Oswald Chambers and A.W. Tozer, along with many of the writers of the Bible. In addition to offering Sunday services at 11 a.m., Sunday school for all ages at 10 a.m., Lockwood said that First Baptist Church of Dorset also offers a Men’s Bible study at the mill in Dorset at 9 a.m. on Saturdays, along with a Women’s Bible study on Monday mornings at a congregant’s home. In the summer Lockwood said they hope to offer Vacation Bible School as well. When he’s not working or pastoring, Lockwood said that he enjoys playing piano, reading, jogging, as well as spending time with his wife of almost 24 years Mary and their three children at their residence in Andover. 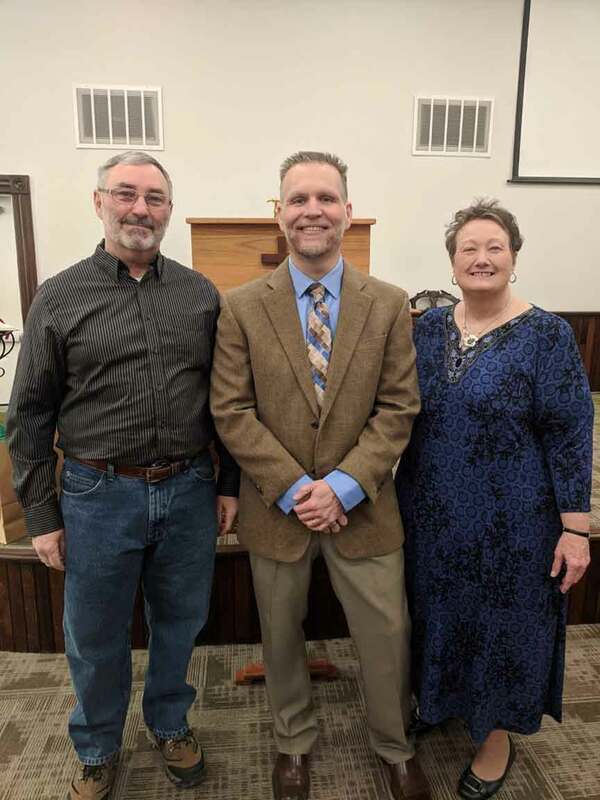 Pictured: Deacon Joe Paul, Pastor Gary Lockwood and Executive Minister/Ministry Development for American Baptist Church of Ohio Jane Gibbons on Sunday, March 3 following Lockwood’s installation as pastor for First Baptist Church of Dorset.